Dinosaurs are very much alive--at least in the mind of Ally Hayden. When a museum accident transports Ally on an adventure back in time to explore the terrain and territory of life-size dinosaurs, she is thrust literally nose-to-nose with the largest and most realistic dinosaur ever to appear on a movie screen--the 20-foot tall, 15-ton Tyrannosaurus Rex. DVD: Standard 1.33:1; audio English Dolby Digital 5.1, French & Spanish Dolby Digital 5.1; subtitles English, Spanish, French, Portuguese; closed-captioned; single sided - single layered; no chapters; not rated; 44 min. ; $19.98; street date 7/3/01. Supplements: Behind the Scenes Documentary; Theatrical Trailers. As I noted in my review of 1985’s The Dream Is Alive, IMAX features have changed over the years. Whereas the earlier efforts mainly offered documentary-style views of various places and sights, more recent films presented plots and overriding themes. This isn’t a perfect rule, for it’s clear that IMAX hasn’t gone totally toward story-driven movies, but it seems more apparent as the series progresses. On the surface, this sounds like a good thing. After all, the very earliest motion pictures had little in the way of story; instead, audiences flocked to them due to the sheer novelty of watching images move. To a certain degree, one might claim that IMAX films have succeeded in the same manner. The sheer size of the screen could be dazzling for viewers, and the content itself may not have mattered as much. However, this isn’t a great analogy because IMAX films are popular beyond the novelty of the huge screen. The best IMAX efforts offer a terrific “you are there” atmosphere, and unlike early movies of men riding bicycles, they put us in situations most of us would never experience. The flicks work because of the awe-inspiring visuals that let us see vistas and worlds we’d otherwise not witness. Dinosaurs and IMAX would seem to be a natural fit. After all, the giant screen should make the huge creatures come to life in a way that might make Jurassic Park look tame. Unfortunately, as witnessed during 1998’s T-Rex: Back to the Cretaceous, the format’s potential lagged far behind the realization during this exceedingly lackluster movie. The main problem I had with T-Rex stemmed from its excessive amount of story and lack of dino-action. T-Rex introduces us to Dr. Donald Hayden (Peter Horton) and his teen daughter Ally (Liz Stauber). Dr. Hayden spends a lot of time at dinosaur digs, and this keeps him away from Ally much of the time. She wants to visit the sites, but he claims that they’re too dangerous for her, an idea that seems to be bolstered by an accident that almost sends a fellow paleontologist, Elizabeth Sample (Kari Coleman) to a deadly drop off of a cliff. The movie then jumps periods as Ally pops back and forth between present day and the ancient past. Along the way, she encounters a number of dinosaurs, and she also meets noted old-time dino discoverers Barnum Brown (Laurie Murdoch) and Charles Knight (Tuck Milligan). Her Dad spends much of the movie in pursuit of Ally, as she disappears from the museum but he can hear her yells from her time… back to the Cretaceous! Far too much of T-Rex devotes itself to Ally and her explorations. It takes quite some time before we even meet our first computer-generated dinosaur, and all of those encounters were quite lackluster. Ally wanders around and occasionally meets up with a critter, but not much comes of it. The animated dinosaurs lacked great realism, and they never inspired any sense of wonder or “you are there” believability. The DVD was also hindered by the fact that T-Rex appeared as a 3-D feature in IMAX theaters. We don’t get that extra element on our home screens, but we’re still stuck with the silly “coming at ya!” conventions that plague most 3-D films. I hadn’t known that T-Rex was a 3-D production before I viewed the DVD, but as I watched, it quickly became apparent that this was the case. In my notes, I actually wrote “felt gimmicky, like should be 3-D”. I often felt as though I was viewing a bad Dr. Tongue flick. Ultimately, T-Rex felt like a case of the old bait and switch. Audiences were lured in with the prospect of exciting, life-side images of realistic dinosaurs. Instead, they found a silly teen drama about a somewhat neglectful father and his frustrated daughter. These elements were punctuated with occasional shots of unconvincing creatures and a few scientific factoids along the way. Unfortunately, T-Rex tries to pack in too many different elements during its 44 minutes and it fails to do any of these well. 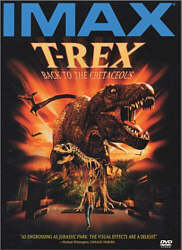 T-Rex: Back to the Cretaceous appears in an aspect ratio of 1.33:1 on this single-sided, single-layered DVD; due to those dimensions, the image has not been enhanced for 16X9 televisions. Although not without concerns, for the most part T-Rex offered a fine visual experience. Sharpness consistently looked crisp and detailed. At no time did I notice any significant signs of softness or haziness, as the movie always appeared to be distinct and well-defined. Moiré effects and jagged edges didn’t cause any problems, but I did see a few print flaws. At times, I witnessed light speckling and grit. However, these concerns stayed modest throughout the movie, and I detected no signs of more serious defects like scratches, blotches tears or debris. As a whole, the film was clean and reasonably fresh. T-Rex offered a fairly naturalistic palette that matched its ancient visuals, and the DVD replicated these well. The film showed clear, accurate hues that displayed no signs of bleeding, noise or other concerns. The generally subdued nature of the movie’s earthy tones meant that they never appeared tremendously vibrant, but they remained solid nonetheless. Black levels were deep and rich, and shadow detail looked clear and appropriately opaque; I never experienced any problems during low-light sequences. T-Rex could have looked cleaner, but otherwise this was a fine picture. Also terrific was the Dolby Digital 5.1 soundtrack of T-Rex. The soundfield offered a very active and immersive affair that almost made the movie interesting. All five channels provided well-delineated audio that seemed to be nicely involving. Most of the speech remained centered, but some lines cropped up from the sides or rear. However, music and effects were the dominant elements of the program. The score showed positive stereo separation and good reinforcement from the rear, while effects made the show come to life. Those elements were accurately placed and they popped up in logical locations during many parts of the movie. Because so much of T-Rex took place in unexciting situations - like the museum - it lacked the consistently heavy surround presence to be great, but enough action occurred to make it a generally fine experience. Audio quality seemed to be solid. Some dialogue sounded a little tinny, but for the most part I thought the lines were fairly natural and crisp, with no problems related to edginess or intelligibility. Music appeared to be nicely dynamic and bright, and the score showed good depth and range. Effects were appropriately loud and engaging, as they different elements demonstrated clear highs and rich lows. The results won’t quite make anyone forget the sonic pleasures of the Jurassic Park films, but the audio worked well nonetheless. T-Rex compiles a few very minor extras. In addition to trailers for both T-Rex and IMAX films in general, we get a Documentary. Unfortunately, it is really nothing more than a very brief promotional featurette. It shows clips from the movie, a few shots from both the set and the effects lab, and sound bites with a mix of cast and crew. Did I learn anything about the making of the movie? Not really, as the program mainly blasts us with hyperbole to lure us into the theater. The four-minute and 45-second piece was a pretty uninteresting piece of fluff. Would additional detail have made T-Rex: Back to the Cretaceous a more compelling DVD? Probably not, for the movie itself was a bit of a dud. Instead of the exciting, photo-realistic dinosaurs we’re led to expect, we mostly find a flaccid tale of an ignored teen who wants to please her Daddy. The few scenes in which the dinosaurs become involved show unconvincing CGI animals and they don’t compensate for the story’s banal nature. The DVD itself offers fine visual and auditory quality, but it really skimps on extras. When I reviewed The Dream Is Alive, I was torn when I made my recommendations; I liked the movie but felt that the package was too skimpy and brief to merit its $19.98 list price. T-Rex does little to negate those concerns; it runs eight minutes longer than Dream and tosses in a couple of additional extras, but the differences in value-related content are minor. Add to that my feeling that T-Rex was a weak program and I think this is a DVD to be left on the shelves.